Ok, as I mentioned in No More Bagels (and Back Into Shape), all of the bagels I had in December have taken a toll and that I would make a point to eat slimmer in the new year. A couple weeks in, I’m doing better but not great. I’ve has more hard boiled eggs, smaller portions and only had one bagel, and that was “scooped out” which gives eaters an illusion of it being acceptable. So, ugh, ok ok I gave in and I have a salad for dinner. Blech! I mean, salads are ok, but it’s the principle of it all. “Salad” is a side dish, it’s not a meal. Like soup. Sorry, Jerry, Bania was right. .. soup’s not a meal. But, unfortunately this might be a regular thing for me. I ordered this at a big deli. 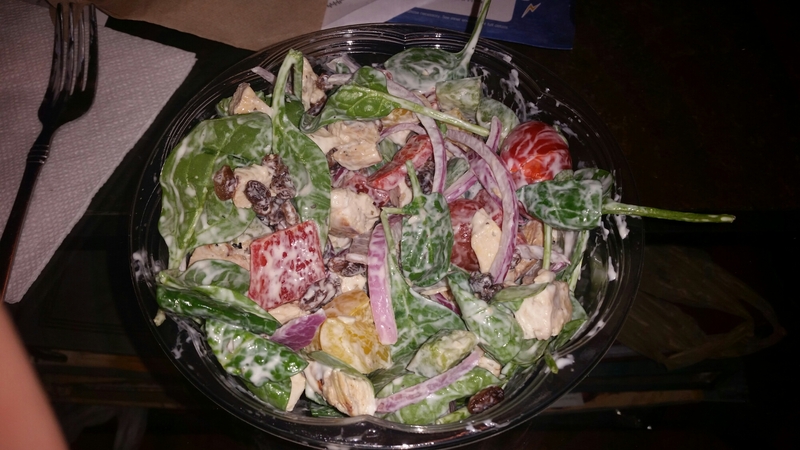 Spinach, chicken tomatoes, peppers, raisins, onions and ranch dressing. REQUEST OF ANYONE READING: Can anybody offer up a better and TASTIER combination? Next I am now a good son! The salad is a good idea. Have protein with it like a piece of grilled chicken instead of it being in the salad. Plus the ranch dressing has calories in it that you probably shouldn’t be adding. Better to have a light dressing made from balsamic vinegar, olive oil, pepper, salt and a bit of lemon juice. Just my opinion! I lost 120lbs going paleo and ate butter veggies, bacon and steaks all day. I’m still here 5 years later doing the same thing and feeling great! Food lost it’s power for me and I actually did a little experiment where I didn’t eat for 48hrs and that voice inside for bagels was silent. This is coming from a wheataholic too! Did you try any others yet? I have a couple more recipes for you. Salads can be really delicious once you discover the combinations that you like. Ranch dressing is yucky 😜. oh, I’m ok….you have no idea the significance that I AM right side up considering the fact that I am completely computer illiterate…that’s why it makes me laugh…now, if you tell me you work in IT you will read about a woman in Connecticut who died…literally died laughing. lol! if I was there I would help you…maybe not though….it is rather endearing. Lol…I am so PROUD of you!!! (You will always be sideways guy to me, Though) LOL!! I am so proud of you!!! Did you buy the cigar just to celebrate today’s major accomplishment? Now I have to call you Dean. I eat a lot of spinach salads. Very tasty with Ken’s Steakhouse Lite Creamy Caesar dressing. I mix a bit of skim milk with the dressing. It still tastes great. I put an occasional hard boiled egg on for protein. I add some carrots and celery and I have a filling meal. Salads are boring, but they have helped me to maintain a 40 pound weight loss over six years. Spinach tastes so much better than plain lettuce. Just a half a cup a day of fresh spinach can reduce your chance of getting osteoporosis by 40%! And yes, men can get it. My mom had it and shrunk 4 inches in two years. I cant do salad for dinner…I have a mental block on salad filling me up. I tend to go for full protein and find shrimp or chicken with a bit of lemkn does the trick. You can virtually eat as much as you want and not feel guilty. Also sweet potatoes…most filling! I do a combo of paleo, protein and gluten free just cause it works for me. Best to experiment. Bottom line is you need to feel full or you will stray. I stopped all white carbs for 3 months. It was only painful for about 2-3 weeks. Now I’m surprised how I dont crave them! There is something about salad…just feels like punishment to me. Try boosting your proteins…you could have had steak, and you’d feel less deprived. Good Luck. As others have said the ranch dressing almost counters the whole salad as far as health. Try using avocado for creaminess and healthy fat and a spicy tomato based vinaigrette for a mexican style salad with beans, chipotle chicken, corn (not great for you but so tasty), and some greens. Chipotle makes a decent salad or burrito bowl but the rice can add up in calories! I love Caprese Salads: Made with fresh tomatoes, fresh basil and fresh Mozzarella. Salt and pepper to taste, then sprinkle with extra virgin olive oil. I could eat these 7 days a week… it is also one of the things recommended on the South Beach diet. But you need to vary your diet, don’t just eat salads. Good Luck! Eat what you like, just about 20 percent less of it. Moderation, my friend. Portion control.